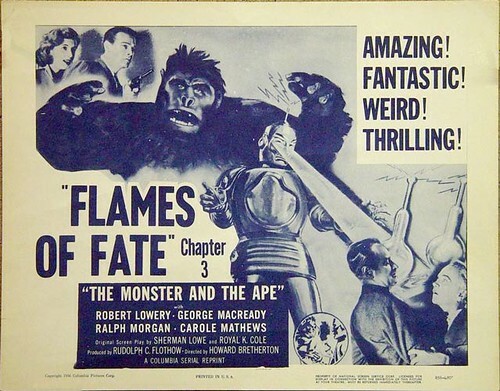 But back to the chapter play apes - I have been intrigued by Corrigan's appearance as the titular ape in THE MONSTER AND THE APE (1945) for a good while now. Considering his character is in the damn title, you know you're guaranteed ample gorilla suit action. Having only watched the premier chapter, I am encouraged that he has already seen a decent amount of screen time. So far, so good - decent action and a robot too! I've tagged on a trailer but the brief shots of Ray Corrigan in his 40's suit are dark and muddy. Still, it gives you a taste of how fun this serial can be.